Consumers want to know that there are real people behind your logo. And while the speed and convenience of digital tools make them a natural choice for that type of communication, online isn’t the only available conduit for achieving humanization. I’m sitting on a Southwest Airlines flight, returning from Austin and the exhilarating and exhausting South by Southwest conference. Airline in-flight magazines always devote the first few pages to messages from employees, usually a pointless, sleep-inducing welcome from the CEO or some such aeronautical overlord. Instead, Southwest used that space effectively by showing passengers a bit about the inner workings of the airline. It’s a description of the tricky process of getting drinks and snacks on 3,200 flights per day, written (ostensibly) by Scott Halfmann, their VP of Provisioning. It’s filled with insider info tidbits like the fact that Provisioning is known as “Provo” inside the company, that there are 22 stations across the country, and that each flight is serviced by a forward and rear provisioning team. 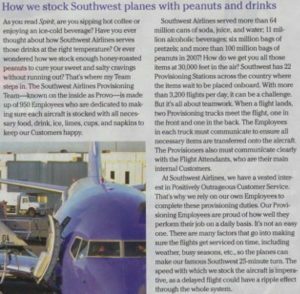 Cleverly, the column includes prominent references to Southwest pillars like Positively Outrageous Customer Service, the airline’s commitment to turning flights in 25 minutes, and the fact that all of their Provisioning staff are employees, not contractors. It ratifies the decision to fly Southwest in an elegant and contextual way. This column humanizes an interesting (at least to me) but unexplored component of the Southwest brand. And while it’s just a page in a magazine, it has real social media potential. Facebook page by Provisioning team. Twitter account. Video content and Flickr channels. Customer online voting for what type of sodas to carry. Honey roasted versus Dry roasted peanut game. Consumers want to be part of brands they support. Find a way to let them see how your company operates, and more importantly the people that make your company a success. As soon as this flight ends, I’m getting my high five ready.